Habit: Annual, coarse, 10--200+ cm. Stem: erect, branched; nodal spines present or 0. Leaf: generally alternate (proximal 2--6 occasionally opposite), petioled or distal sessile, linear to nearly round, often +- palmately or pinnately lobed, ultimate margins entire or +- toothed, faces minutely coarse-hairy or +- strigose, generally gland-dotted. Inflorescence: heads unisexual, 1, axillary or in raceme- to spike-like clusters, pistillate generally proximal, staminate generally distal. Staminate Head: 3--5 mm diam; involucre +- saucer-shaped, phyllaries 6--16+ in 1--2+ series, free, +- 1 mm; receptacle conic to columnar, paleae spoon-shaped to wedge-shaped or linear, membranous, distally +- soft-hairy or minutely coarse-hairy. Pistillate Head: 2--5+ mm diam at flower, 6--20+ mm diam in fruit, +- ellipsoid; bracts 30--75+ in 6--12+ series, all proximally fused or outer 5--8 free, tips free, mostly +- hooked except distal 1--3 (generally longer, stouter), together becoming a hard, prickly bur. Staminate Flower: 20--150+; corolla +- funnel-shaped, +- white, lobes 4--5, erect or reflexed, filaments fused, anthers free or weakly fused; style tip undivided. Pistillate Flower: 2: corolla 0, style tips linear, exserted. Fruit: fusiform, black, enclosed in obovoid to ellipsoid, 2-chambered bur; pappus 0. Habit: Plants 10--80(200) cm. Leaf: petiole 2--10(14+) cm; blade 4--12(18+) cm, 3--10(18+) cm wide, occasionally palmately 3--5-lobed. Fruit: bur 10--30+ mm. Chromosomes: 2n=36. Ecology: Disturbed, seasonally wet, often alkaline sites, in grassland, marshes, watercourses; Elevation: generally < 1400 m. Bioregional Distribution: CA; Distribution Outside California: worldwide, native to America. Flowering Time: Jul--Oct Note: Highly variable. 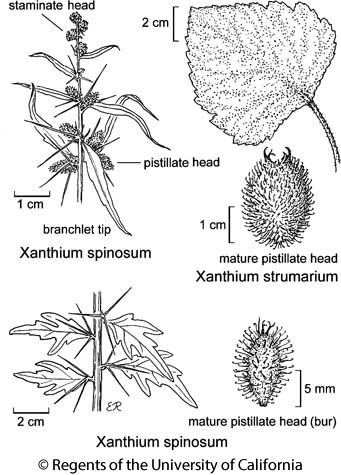 Citation for this treatment: Bruce G. Baldwin, adapted from Strother (2006) 2012, Xanthium strumarium, in Jepson Flora Project (eds.) Jepson eFlora, http://ucjeps.berkeley.edu/eflora/eflora_display.php?tid=5591, accessed on April 21, 2019.